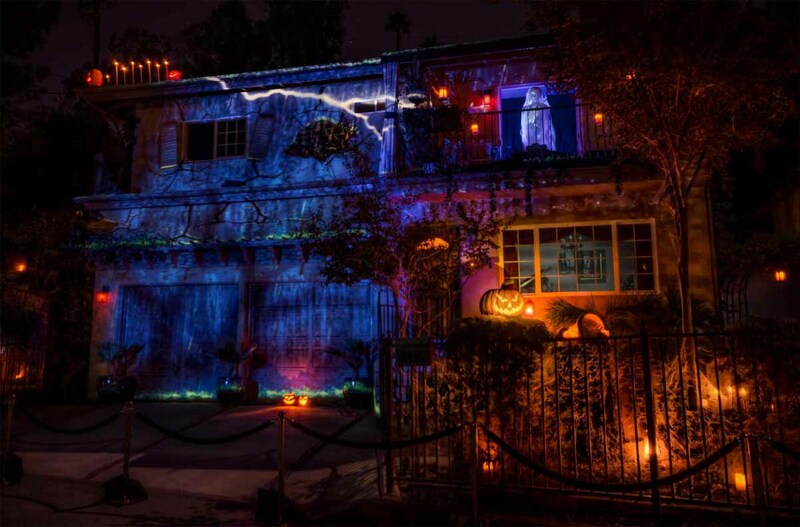 Since the demise of the late, lamented Hallowed Haunting Grounds, this excellent home haunt has taken the crown for the best amateur Halloween attraction in Los Angeles. 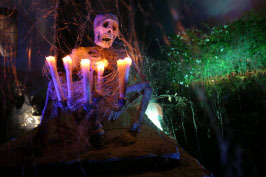 More than a decorated yard, The House at Haunted Hill is a full-blown show, telling a 20-minute ghost story through the use of recorded dialogue and music, timed to professional-quality special mechanical and lighting effects. 2018 Dates: None. 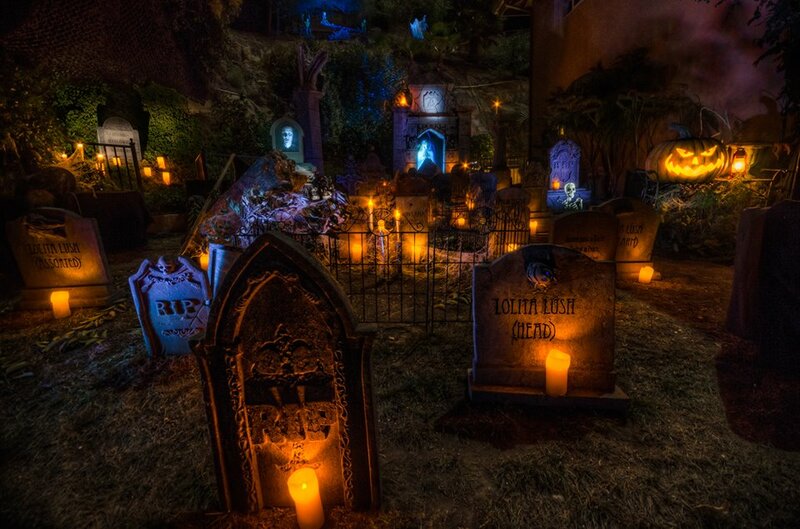 The House at Haunted Hill will go dark this Halloween, with a promise to return in 2019. 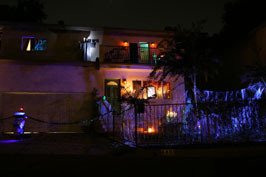 Note: The House at Haunted Hill really is on a hill - on a twisting side street whose street sign is easy to overlook in the dark. If you do not have a GPS, bring a map and keep your eyes peeled. Be aware that Saltillo Street itself is blocked off to automobile traffic, so you will have to park on Canoga Avenue and walk up a slight incline. 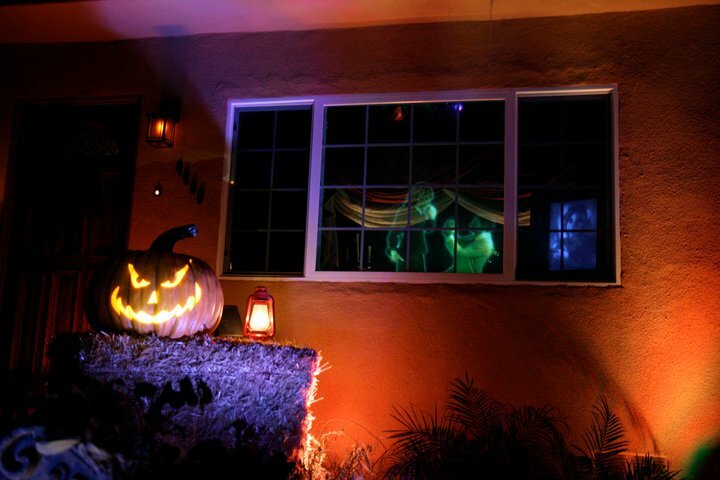 Read more in our House at Haunted Hill Archive. 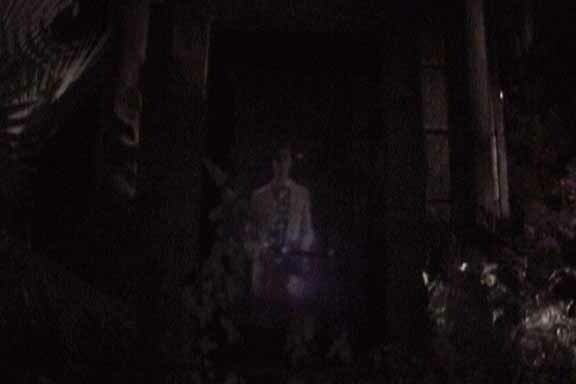 The House at Haunted Hill features an impressive array of mechanical and lighting effects to illustrate a dramatic ghost story, told with pre-recorded sound, including narration, dialogue, and music. The plot involves a young Hollywood hopeful who marries the wrong man - his vengeful late wife returns from the grave to ruin the wedding night. The story runs at approximately 20-minute intervals. You do not have to arrive at the exact start times in order to see the show, but it helps. 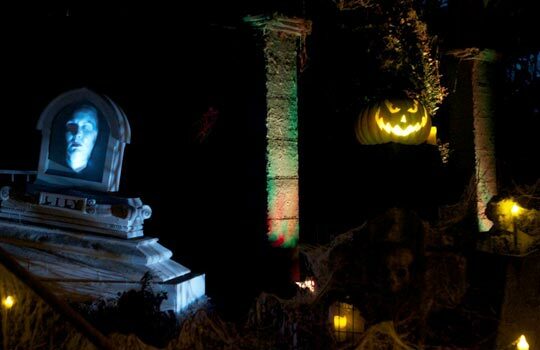 Admission and parking for the House at Haunted Hill are free. 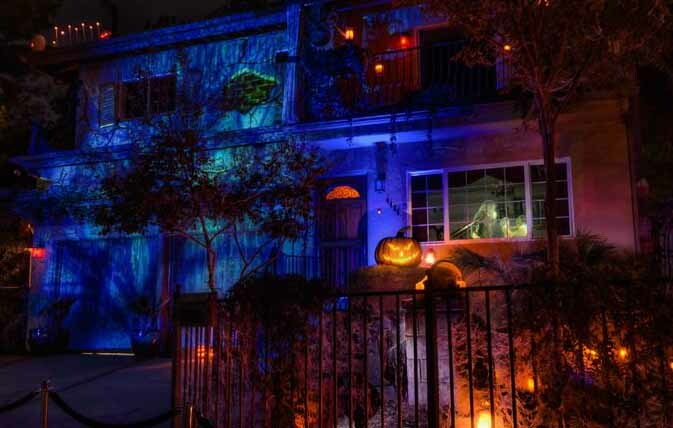 However, the street is usually blocked off to cars for the safety of foot traffic, so be prepared to walk up that haunted hill! 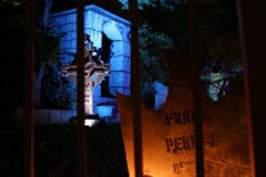 In operation since 1999, the two-story house began with an elaborate display of randomly timed mechanical effects: black-lit drapes fluttering in the wind; skeletal figures and floating ghosts peeking out the windows; a skeleton on the porch and a phantom bride out back; tombstone in front of the main entrance holding something in that wants to get out. 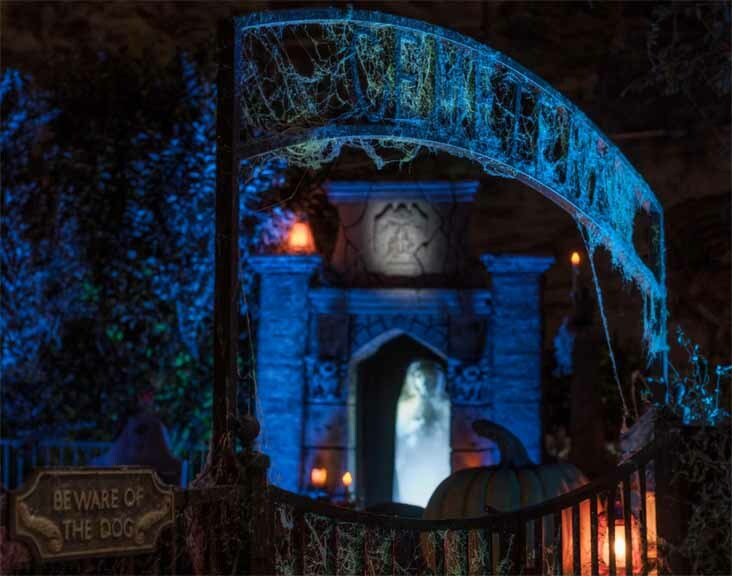 What immediately impressed visitors was the use of yard space, stretching up the hill to the back of the house, with childish skeletons on a teeter-totter, singing "Itsy Bitsy Spider:" a skeleton on a swing; an animated statue delivering an invocation that rouses the spirits; phantom shadows flitting across the ground, and the silhouette of some figure with an ax chopping away at something unseen. 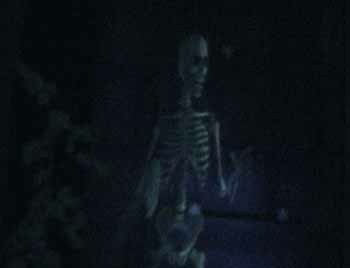 For 2007, the House on Haunted Hill took a quantuum leap forward, offering a 20-minute scripted show (written by playwright Ed Valentine), complete with a musical score by Emmy-nominated Christopher Hoag. Other entertainment industry professionals chipped in, and even Tim Doggett (of Hallowed Haunting Grounds) and Nathan Hamilton (Turbidite Manor) lent a hand, in an effort to create something truly spectacular. The basic props and effects were retained from previous years, but they were integrated into the story, no longer turning on and off apparently at random, but timed to go off at specific moments in the narrative.